First we need to define FOUNDING FATHERS. Some say it was the signers of the Declaration of Independence (1776) , others the signers of the Constitution of the United States (1787). Some historians give credit to even others. Obviously we should give most credit to those who signed the Declaration of Independence. They risked it all! Eleven years later, more American patriots decided to sign the Constitution of the United States (aka America). George Washington: 1st President of the USA. "It is impossible to rightly govern a nation without God and the Bible". "You do well to learn our ways of life, and above all, the religion of Jesus Christ" (written by his aid). "It cannot be emphasized too strongly or too often that this great Nation was founded, not by religionists, but by Christians; not on religions, but on the Gospel of Jesus Christ. John Jay: 1st Chief Justice of the Supreme Court of the USA. "... it is the duty as well as the privilege and interest of our Christian nation, to select and prefer Christians for their leaders". "I have examined all religions, and the result is that the Bible is the best book in the world". "I think the system of morals and (Christ's) religion as He left them to us, the best the world ever saw or is likely to see". "... to cause the benign religion of our Lord and Savior Jesus Christ to be known, understood, and practiced among all the inhabitants of the earth". "I am a real Christian - that is to say, a disciple of the doctrines of Jesus Christ". "Intelligence, patriotism, Christianity, and a firm reliance on Him, who has never yet forsaken this favored land, are still competent to adjust, in the best way, all our present difficulty". "Without God, democracy cannot and will not long endure". "I just want to do God's will". Abe Lincoln warned: "The philosophy of the school room in one generation will be the philosophy of the government in the next". THINK ABOUT IT !!! Don't you see it happening now? 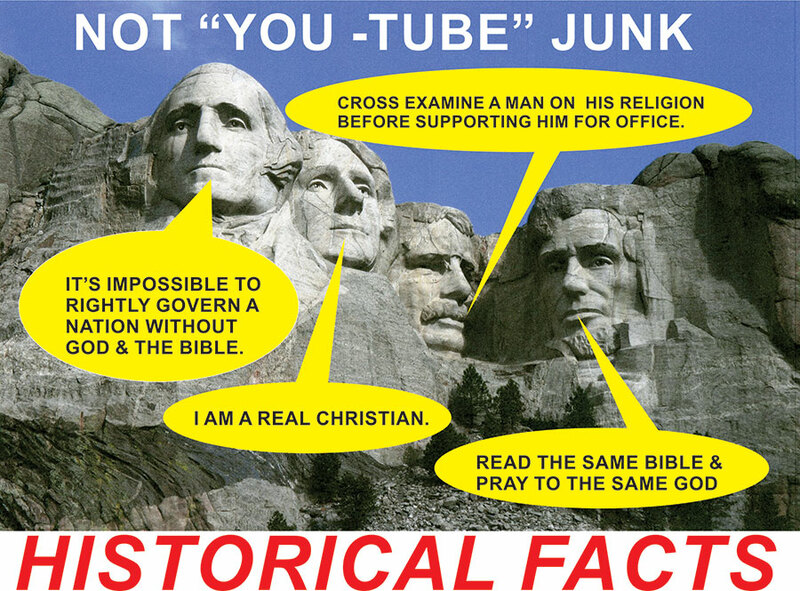 Our Christian history is gradually being misdirected from our future offspring. We may be the last generation that has a chance to turn things around. As proof, just ask your children, and/or grand kids what they know about how our Country was started. And the principles in place at that time.